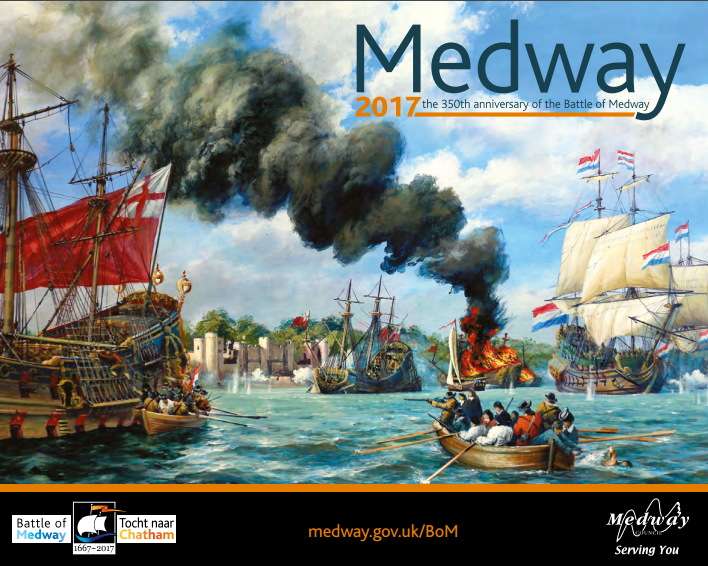 The Medway folks are celebrating the Battle of the Medway with various events climaxing in fireworks at Upnor Castle on the 17th June. It looks great if you can do it on foot, though my plan to sail there to watch the fireworks has been shot away, as it seems great flotillas of Dutch yachties have booked all the nearby berths that can be found! Duh! Over that weekend and the one before there’s quite a lot going on besides the fireworks, including living history events at Upnor Castle, Dutch and British warships, a a fun fair, food and drink stalls and a river pageant sail past the Dockyard and Upnor Castle. There’s also live music, walkabout entertainments and clog dancing performances will run throughout the evening. Check the leaflet for details! They held Queenborough for a few days, I hope there will something to mark that too. Queenborough was twinned with Brielle in 1967. The twinning was marked by a ceremony to finally relinquish Dutch control over Queenborough after 300 years as it had not been one of the captured territories returned in the Treaty of Breda in 1667. So I think Queenborough may be pretty full too. Sending in fireships may be your only hope, or perhaps a small boat raid. At that time of year it can be full anyway! Thanks for the tip.